Buy 2 of any set and get an extra 15% OFF. The Smart Abs Stimulator adopts the most advanced EMS technology and is made of high-quality material so that you can build a charming body shape without even lifting a finger under its help! This training gear is secure and efficient! The use is simple. First, use your nail or small device to turn the battery cover. Then insert batteries, make sure batteries are facing the right way. 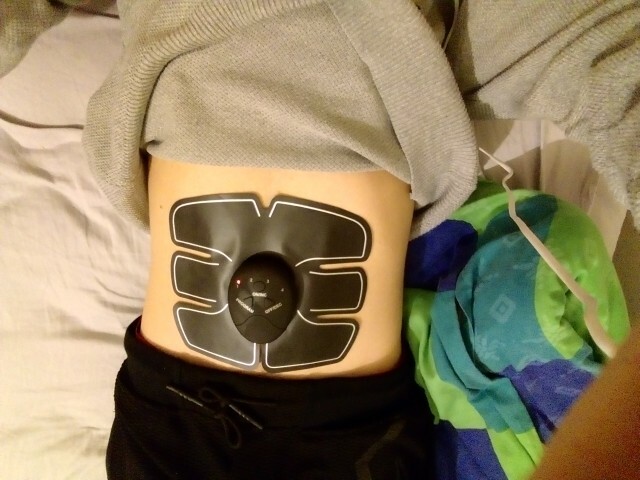 Afterwards, connect the main device with the gel pad, then attach it between your ribs and hips.After that, press the middle button to turn on the main device, the indicator light will flash 3 times and will auto turn off about 5 seconds later if you do not attach to body. Use your nail or small device to turn the battery cover. Auto turns off about 5 seconds later if you do not attach to body. Good product, kubui support communicates very well. Thought the product was broken, but turned out to be all good after I realized my mistake. As far as I am concerned this is a good product from a reputable seller. Apologies for any misunderstanding, but the product did not seem to be working initially until I reseated the batteries, so it's likely I had installed one of them incorrectly and it was buyers error.